AM General M814 "The People Eater's Limousine"
(originally dubbed the Gastown Petrol Tanker) is a heavily modified AM General M814 Cargo Truck, with Mercedes Benz W123 limousine body (V123 Lang) on top as seen in . The "People Eater's Limousine" originally started out as an American M814 military cargo truck produced by AM General. The M814 model has an extra long wheelbase, a 20ft long box (6.1m). Two trucks were used for building "The People Eater Limousine". One for closeup shots and the second for stunts and the final explosion scene. 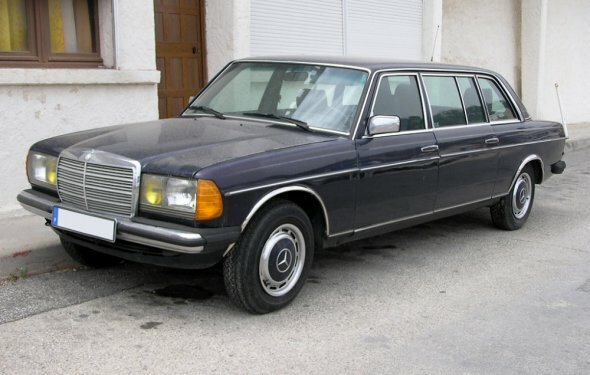 The cabin was removed from both trucks and a bodies from Mercedes-Benz W123 Limousines were put on top. The limousine shells were salvaged from a wedding transportation service that destined the limousines to be crushed. Thankfully the production company got a hold of those shells and used them for the movie. The vehicles were later prepped by the production company, special effects and production designers to give them their final look. The front fender wells were enlarged to accommodate for massive exhaust pipes running down the whole length of the limousine body and then some more. The front grille is made of three different bumpers and an extra Daimler Majestic grille. The windows are lattice-cut, the steering wheel is decorated with woven strands of hair. The automatic stick is made of a revolver (squeezing the trigger would engage the gear) and the throttle pedal is decorated with a dollar sign made of coins. 'The People Eater's Limousine' was designed by Peter Pound and originally named the Gastown Petrol Tanker. It functioned as the vehicle of choice of the main businessman of the Wastelands - The People Eater. Holding everyone accountable for the losses and keeping books on everything, The People Eater would not let his signature vehicle be just a standard War Rig, but rather a source of profit, even on the run. Therefore his rig refines fuel constantly in motion, it is also a refueling station for all the vehicles in Immortan Joe's armada. The rig itself is protected rather poorly. There is only one gunner protecting the cabin of the rig with a machine gun mounted on the roof, one driver and armed with a pistol - The People Eater himself. There are a couple of 'flamers' armed with crossbows on the tankers, but they never engage in action. The People Eater's Limousine joins the pursuit of The War Rig shortly after being called as reinforcements by The Citadel. The vehicle leads an armada of Gas Town vehicles, which include pole-cat vehicles & flamers. The vehicle's appointed guide and protector vehicle is the FDK. The People Eater's Limousine does not engage in active attacks on The War Rig until its way back to The Citadel where it pulls up next to The War Rig and crushes Razor Cola. The damage done by the explosion of Razor Cola causes the two tanker-refineries to spout fuel until their inevitable explosion.